TGC '10: Can Videogames Save the World? At Triangle Game Conference '10, Six Days in Fallujah Creative Director Juan Benito asked the question: How can videogames change, help, or save the world? Juan Benito is very familiar with how videogames and the real world interact with one another - founder of Rainbow Six studio Red Storm, he's currently the Creative Director at Atomic Games, the developers of the ill-fated Six Days in Fallujah. 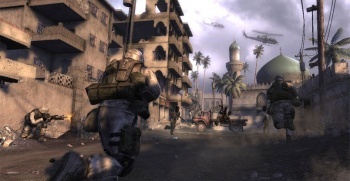 Fallujah was developed in close concert with real members of the armed forces who wanted to tell their stories and experiences of the Battle of Fallujah through a game, but came under fire by people who thought it was disrespecting the seriousness of the situation in Iraq. Benito admitted that the title of the panel might have been a bit too far-reaching - videogames can't save the world, because it doesn't really need saving. He didn't think "How Videogames Can Help the World" fit, either - it was too ambitious. In the end, he'd settled on "Can Videogames Change the World?" By this, of course, he meant change for the positive via gaming and game technologies, not the sort of negative change that tends to pick up coverage in popular media. There's no question that gaming technology can help, said Benito, pointing to the growing idea of "serious games" that help train soldiers and professionals. He himself had worked on a project using videogame technology called ReliefSim in 2002, a simulation to help people run refugee camps and manage a crisis. But hardware itself could be helpful, as shown in the United States Air Force's purchase of 2200 PlayStation 3s to make a cluster supercomputer in the interests of national security. But games themselves could change the world, too. Back in the days of the Mayans, they used to play a game where teams tried to throw a ball through a stone hoop - and the losing team was sacrificed to their gods, while the winners gained influence over the tribes. Even today, he said, isn't a political election essentially a game? Two teams compete, there are rules and strategies, and the winner gets special powers. In fact, he argued, gaming technology could make politics - and the participation in said politics - more efficient. But thinking along the lines of how to run a town or state or even a country through gaming wasn't looking at the big picture, either. Just look at Facebook, said Benito, which is now the fourth most populous country in the world behind the United States. "Facebook is a post-national country... we're going to be thinking less about national lines, and more about empires of the mind." Guilds in games like WoW are often multi-national - does it matter whether that Restoration Druid is from France if they can heal well? Even now, with apps like FourSquare, games were affecting the real world. "The question I asked at the beginning should have been: 'Can videogames run the world?'" "I think the answer is yes," said Benito, but expressed concern that Sony's recent decision to remove Linux OS from the PS3, and Apple's closed-system outlook on the popular iPhone, iPod Touch and iPad would hamper any development: "But who is running the games?"